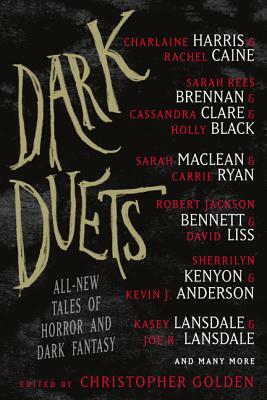 Dark Duets is a feast of eerie and mesmerizing horror, thriller, and dark fantasy tales—an ambitious and unique anthology featuring biting and atmospheric original stories from seventeen pairs of acclaimed writers, all collaborating together for the first time, including New York Times bestselling authors Charlaine Harris, Rachel Caine, Holly Black, Cassandra Clare, Stuart MacBride, Sherrilyn Kenyon, Jonathan Maberry and David Liss. Penned by two authors—and in one case, a trio—who have never worked together before, the stories in this enthralling literary chemistry blend diverse elements and rich themes into mesmerizing and highly combustible tales that delve deep into the shadowy, unexplored realms of the imagination. On the night before Halloween, an unwitting young woman falls under the spell of a dangerous man—and into a terrifying multiverse—in "T Rhymer" by Gregory Frost and Jonathan Maberry. Sarah MacLean and Carrie Ryan explore the exquisite agony of eternal love in "She, Doomed Girl." "Welded" by Tom Piccirilli and T. M. Wright offers an unsettling vision of evil that infects and destroys lives. Mixing the ordinary with the extraordinary, these bold and vivid stories offer a compelling survey of the supernatural world that is sure to frighten and enchant.